Enjoy Egyptian monsters and shooting them? Celcius Games’ first-person, 3D shooter app, Karnak Attack, features ragdoll mummies and other monsters for Egyptophiles. The game boasts the ability to incite fear into players as they try to defeat “hordes” of undead creatures and collect gold. Promos and trailers for the game on Youtube and elsewhere looked promising, but the game falls short for the iPhone. Upon opening Karnak Attack, you are presented with several options: new game, about, and help. See help and get a feel for the different controls. You’ll see what to press to move, swap guns, fire, and reload. The aim of Karnak Attack is to get as much gold as possible and try not to die in the process. Shoot to kill the ragdoll mummies and huge bosses or they will eat at you and your life points. To advance to the next level, you need to find King Tut’s head. Make sure you collect the super weapon along the way otherwise you won’t be able to destroy the super enemy. Users have five lives and multiple weapons to collect the gold and complete the 5 levels. The graphics on the start page of Karnak Attack look spiffy, and the detail of the background and monsters seen during play is not too shabby. Overall, this game has a lot of potential, but it falls short on the total gameplay experience. The iPhone screen is probably too small to accommodate this kind of game (through no fault of the game developer). The game was slow to load, controls were difficult to use, and there was too much lag time for my personal taste. Just moving the character was a chore, and the application wasn’t responsive enough to my touch when I tried to redirect the character’s perspective. 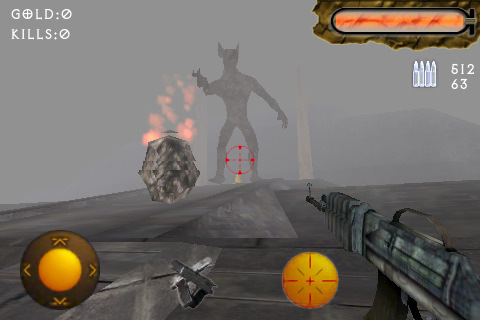 Spinning the character around and aiming the gun at the monsters proved to be a frustrating experience. When I eventually did find the perfect aim spot, the shots fired were slooooow. Most of the time, I felt like I needed three fingers to play the game: one to move, one to look around, and one to fire. That’s just too many fingers for one screen and if played that way, too much screen space gets taken up! (Keep in mind, my fingers aren’t that big.) Developers should look into improving the controls and response time if they want to make money. They should contact Apple too–Celcius is misspelled “Celsus” on iTunes–which isn’t helping sales. As is, I’d recommend you pass on the game. But if you’re still interested, try out the free game online on the afterglow Studios website (available for PCs and Macs) and check out the monsters, weapons, and levels before committing to buy. Doing that additional research on the game will save you $0.99. AppSafari review of Karnak Attack was written by Linda Ta on March 17th, 2010 and categorized under Action, App Store, First Person Shooter, Games. Page viewed 3845 times, 1 so far today. Need help on using these apps? Please read the Help Page.